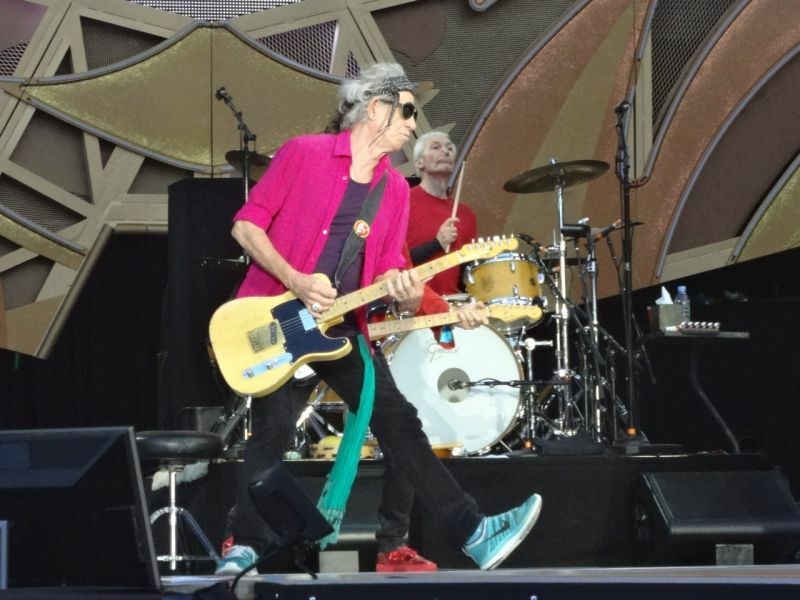 Ronnie Wood and Keith Richards live in Zurich 01 June 2014 photo by Klaus Lauterbach. 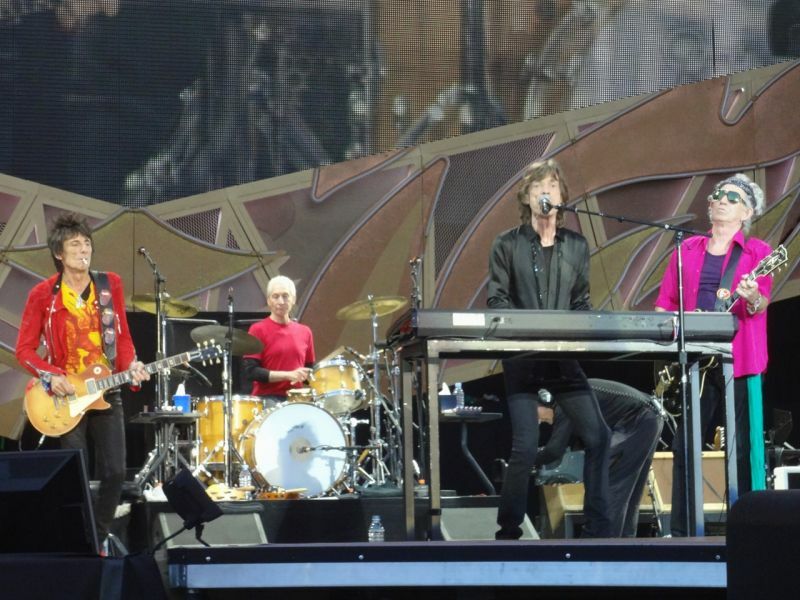 Today was the first real stadium show for The Rolling Stones since a long time. Today was a nice spring day in Zurich with excellent weather for an outdoor show. After arriving from Basel we headed to the Stray Cat Bar, where we head some drinks and met some people. But then it was time to move to the Letzigrund stadium, where it was already really crowded. The stage looked awesome and we moved quickly to a good position in the Golden Circle. Just after a few minutes the support act Temperance Movement started, a great support act, raw sounding like the early Black Crowes. Then the long waiting started. More and more people were entering and the stadium was really packed. 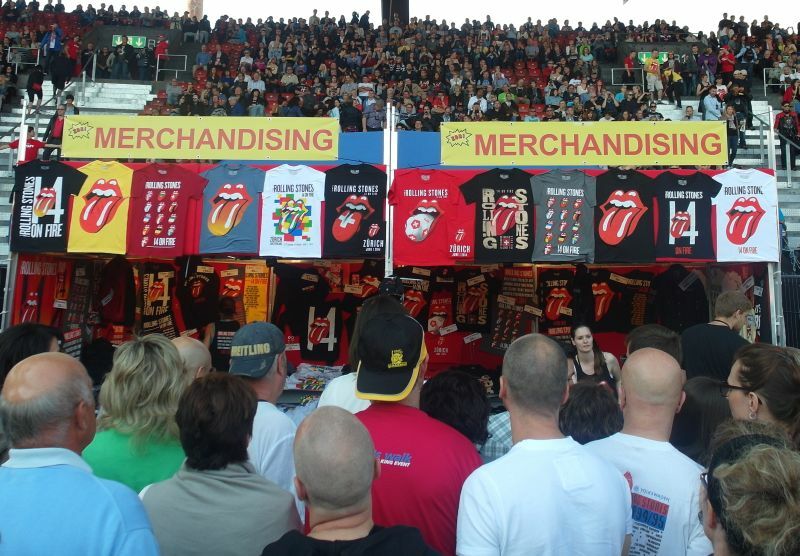 According to Swiss media 48,000 people... And it was full. Showtime at 20.30 with the loud drums and a crystal clear Start Me Up. The band was on fire and they were having a lot of fun. 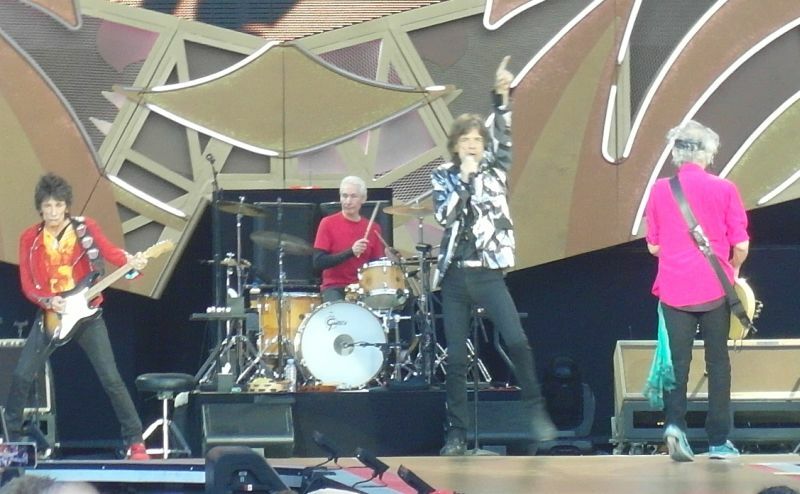 Mick was chatting a lot in Swiss German as well. So the start was already different from the two previous shows. More changes were up: You Got Me Rocking was next, long and good. Then IORR and Tumbling Dice, a very good version. First surprise of the evening was an exciting Worried About You. The set list whiners can stop; if you play this relatively unknown track in a stadium you have balls. Ronnie was extremely good on this one, and Mick of course gave everything. Next was the "new" song Doom And Gloom. The web choice was Let's Spend The Night Together and then the next surprise: Out Of Control, and I was so hoping for this song. Please keep it in, because it rocks! 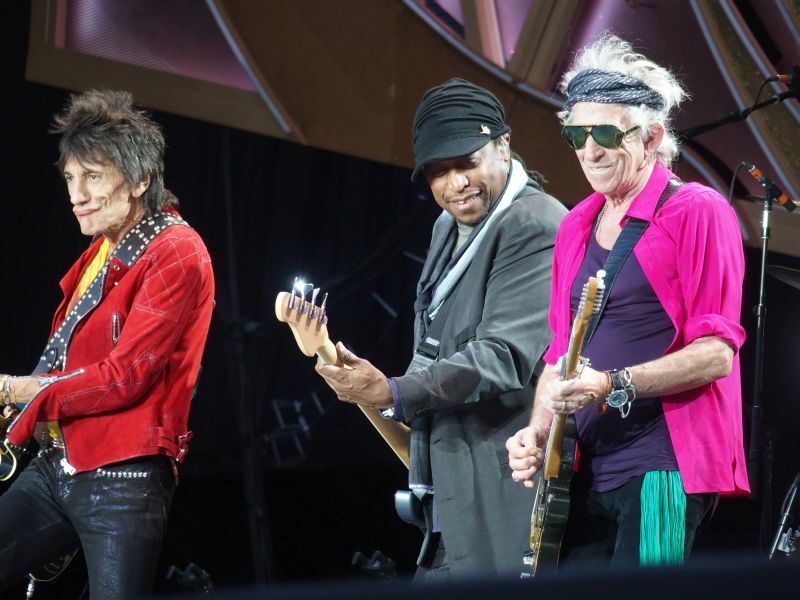 The set continued with Honky Tonk Women, and the band introductions, where Ronnie got a big piece of Swiss cheese as birthday present. Keith sang You Got The Silver and Can't Be Seen. Maybe he should rehearse this last song a bit more. It was sloppy and he forgot the words. Keith was not in top shape this evening anyway. He screwed up a few times and missed some solo's. 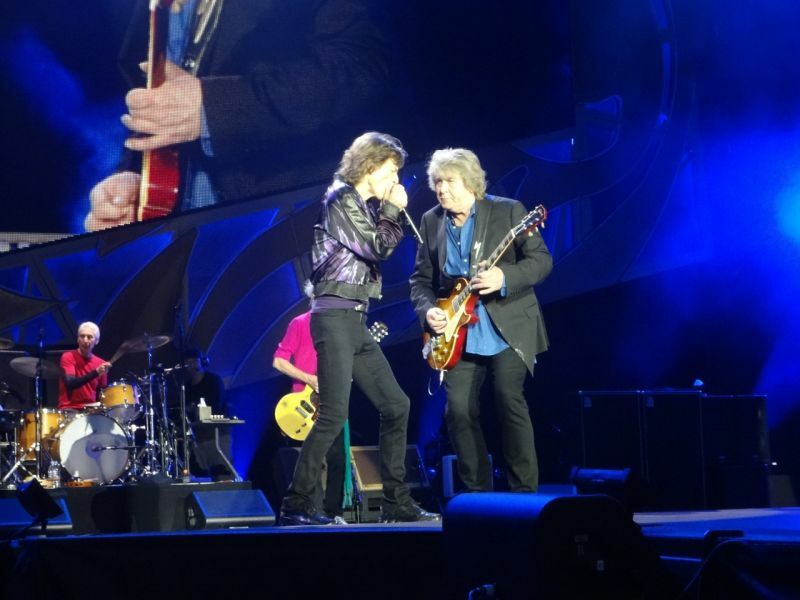 Mick Taylor brought Midnight Rambler to an excellent level. He had some problems with his guitar but this was quickly fixed. The duel with the two Micks was great. The show continued with the more or less fixed set, but the songs are classics so there is nothing wrong with that. 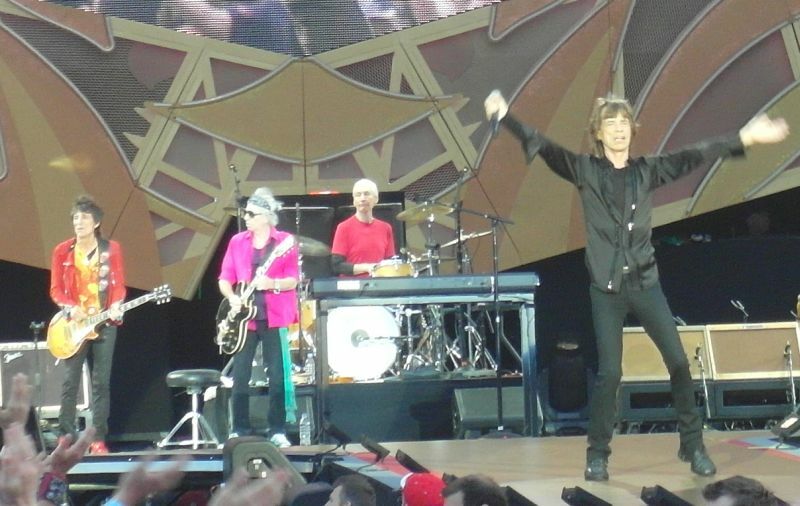 Miss You, with great audience participation, Gimme Shelter, Jumping Jack Flash, Sympathy For The Devil and Brown Sugar (with screwed up intro) finished the show. The encore was You Can't Always Get What You Want with the local choir and a rocking hard Satisfaction, during a very light rain. It was great to see them again. And while writing I am on a flight to Tel Aviv for Wednesday's show. It will be different, first time new place, but good as well. 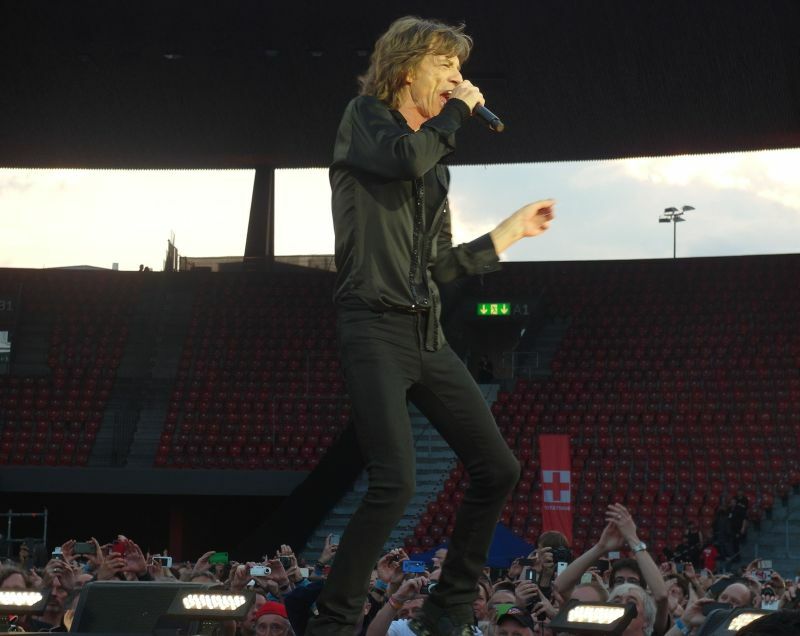 The show of the Stones in Zurich was a dynamite one. The band managed to keep the show going at a lively pace, especially in the first part, and whatever they did - either the ups and downs - was done LOUD! 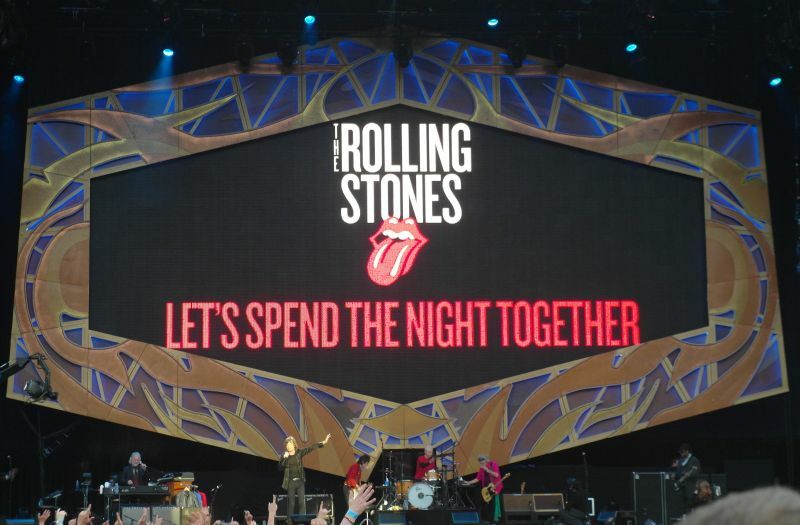 The sound was one of the best I've ever heard in a Stones ' concert, as the guitars were sharp, loud and edgy. The first part of the concert, until Keith's set, was phenomenal. Some surprises were included in the setlist, and Worried About You and Out Of Control were both magnificent. 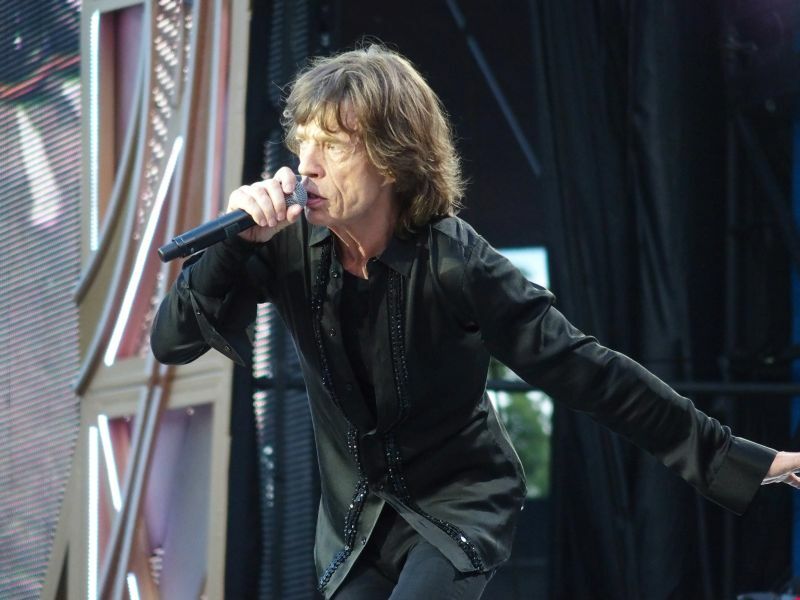 The band was totally on fire, and Jagger appeared at his best. Even You Got Me Rocking sounded very much revitalized! 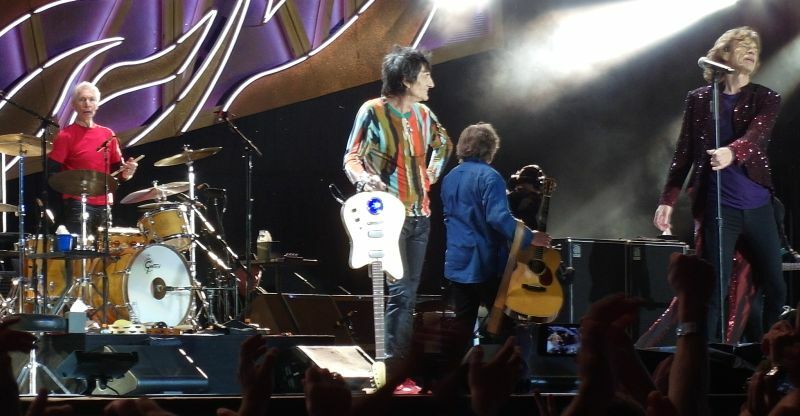 Keith's set included a very nice "You Got The Silver" and a messy "Can't Be Seen", in which Keith missed some of the chord changes, but managed to cover it up by indulging in some very good extra solo parts, so that was definitely a good deal. The second part of the show was a little less consistent, mainly because of Keith apparently losing it, albeit briefly, on a few numbers. Midnight Rambler was great as usual. 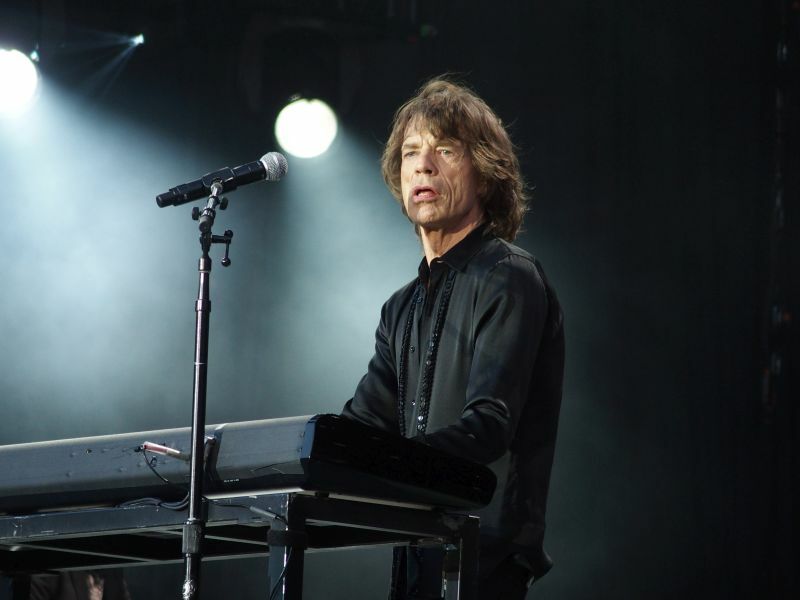 A misunderstanding clearly occurred between Mick and the band as to when entering into the slow part of the song, but that was majestically sorted out by the band. 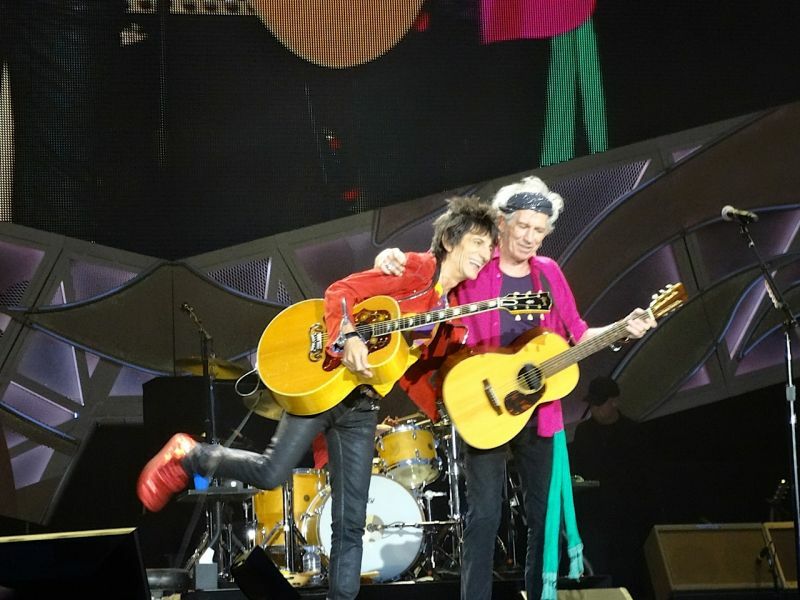 Miss You was also very good, with Keith taking care of the guitar parts while Ronnie kept posing on the runway with Mick. 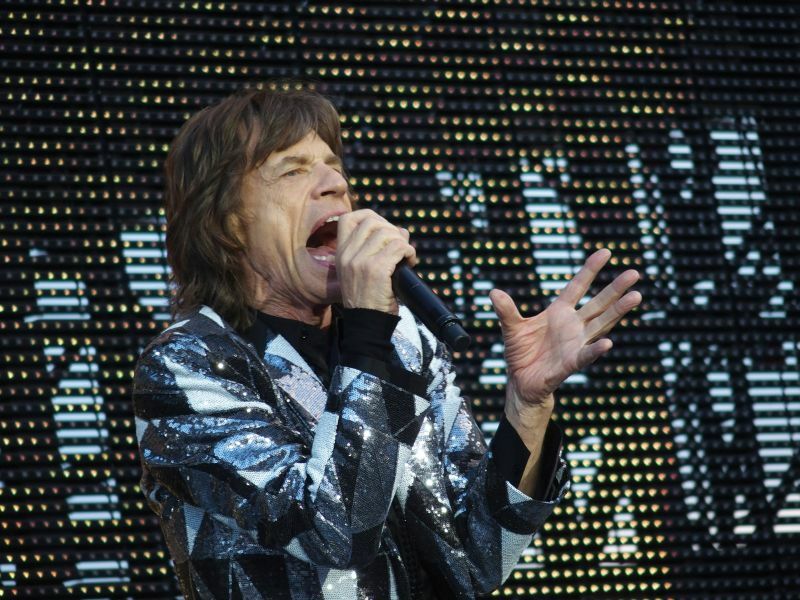 Gimme Shelter, on the other hand, sounded messy. Firstly, Lisa missed her cue while indulging in posing, and in the outro Keith really sounded to have lost it for a while. Ronnie kind of made up for it, but this particular tune - whose contents are very strong and which is arguably one of the best songs ever written by anyone - deserves a much more focused rendition. I think it might help if Lisa stopped teasing Keith during the solo - he's a human being like us all! - and also if the cameramen avoided to repeatedly step on stage during the show in order to shoot short close - ups of the guitar strings. 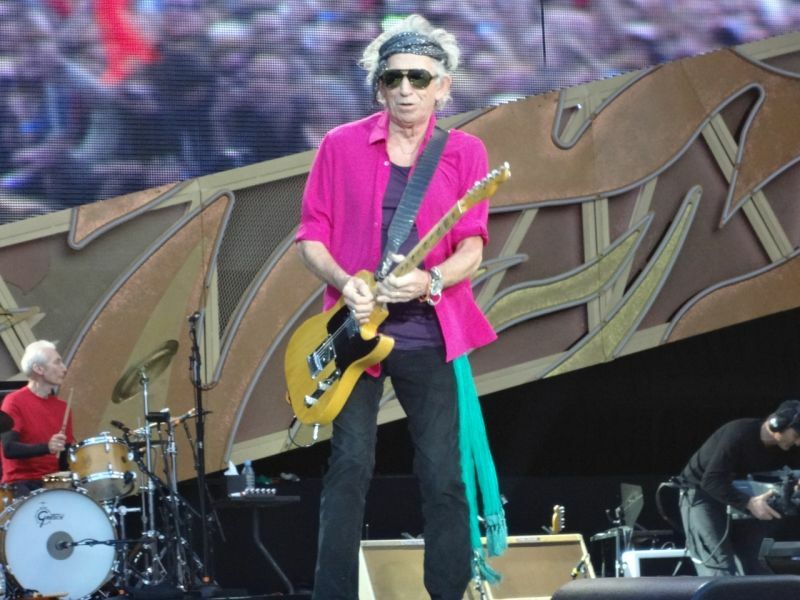 A very strong "Jumping Jack Flash" followed, with Keith driving the song. 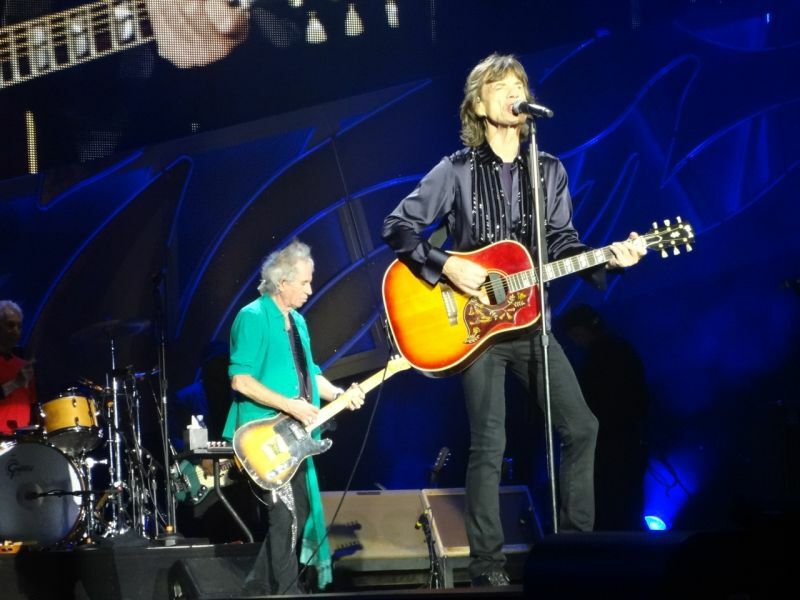 "Sympathy For The Devil" was also very good (a lot of posing by Keith but the solos were OK, and his guitar was so loud!). Even if played quite well, however, Keith looked pretty much devastated on those numbers. I wonder if hearing problems might have occurred on stage. The intro of "Brown Sugar", the last song before the encore, was f***ed up by Keith in his classic fashion, but after that it was fine. The encore tunes were very good, and the rendition of "Satisfaction" was simply amazing, one of the best I've heard so far! Keith shone on that throughoutly, and suddenly looked much more relaxed and at ease! I rate this concert much better than the ones I've attended in Hyde Park last year, simply because the boys seemed to be much more energetic, and the sound of the guitars was really sharp. I also deem that the performance of the band will go better and better as the tour progresses, because You can easily that to boys really are on fire in this leg of the tour. I'm already looking forward to the next gigs I will be attending! Sometimes you wonder, you just wonder........and then you chastise yourself. Can the boys deliver a rip-roaring show ? Can they take their audience to the great highs of yore ? And then as the show started...let alone finished....you realised the questions were frankly redundant - in fact they should never have seen the light of day. The show was simply brilliant - atmosphere developing in the Stadium as the entry of the boys got nearer, cloudy overhead, possible hint of rain in the air (that thankfully did not materialise) and then here they were......bang. 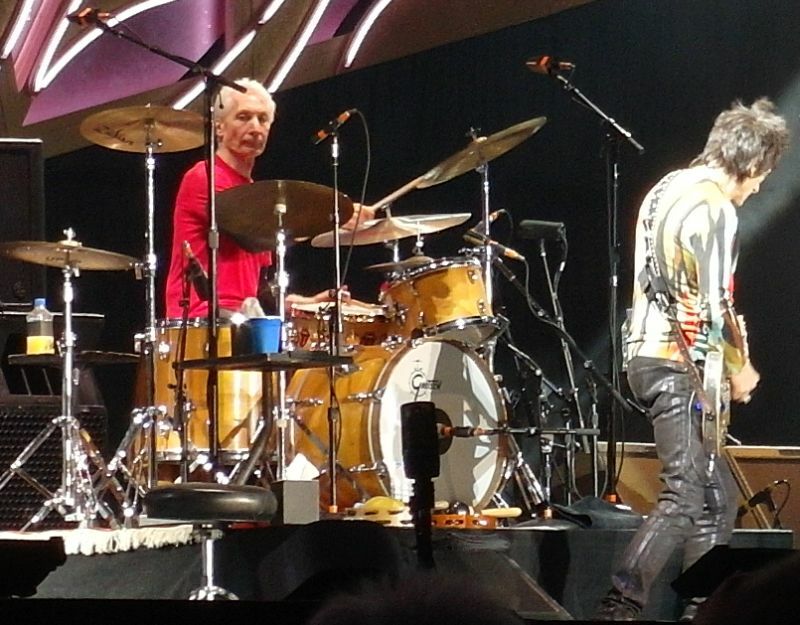 Start Me Up......guitar, drums, keyboards, backing vocals and Mick. Wow. Great start and it never let up. 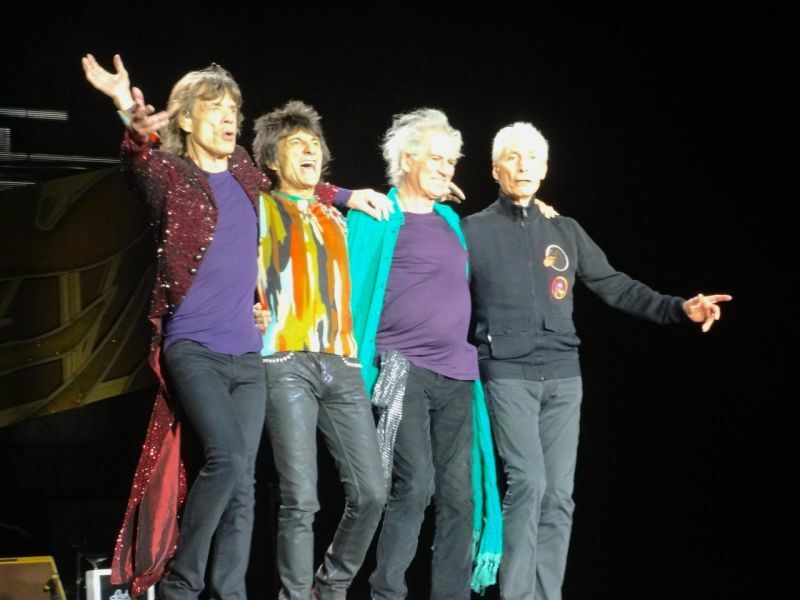 Particular highlights for me - a confident and pitch perfect delivered "Worried about You", Lisa Fischer's storming accompanying vocals on Gimme Shelter and (at least) the first part of Midnight Rambler - Mick's harmonica playing and Mick Taylor's virtuoso perfornace on guitar building the song, heightening the sense of foreboding as the song develops. I say the first part because MT stopped playing part way through - it seemed to me as though he may have broken one of his guitar strings and had to take a replacement guitar. 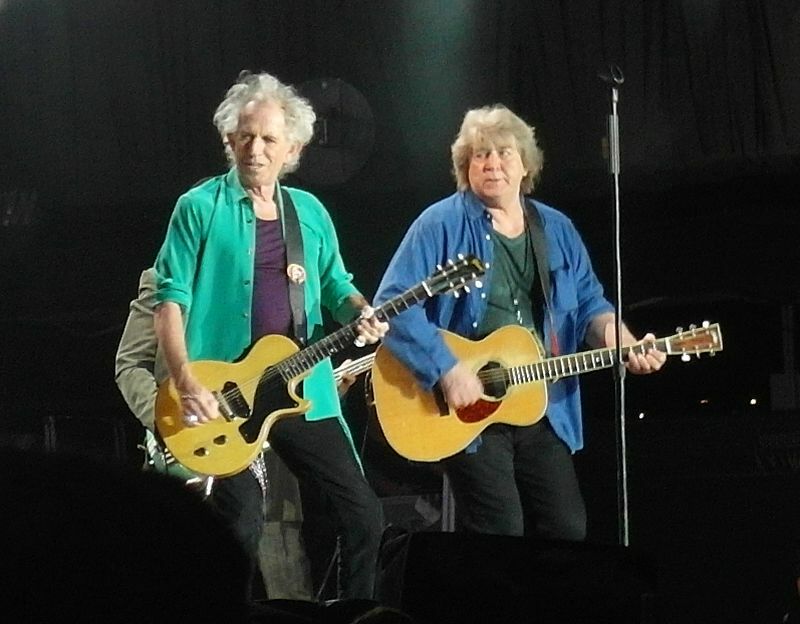 Keith's vocals on his second song struggled occasionally - he may have had a cold or sore throat - the others supporting him to carry the song through. The only lowlight a less than perfect start to Brown Sugar as the guitars and keyboards quickly got into synch after a "loose" start. Ronnie good on his birthday - Keith's humourous observation that it was his 97th!! Charlie - the backbone and heartbeat of the band ensuriong that the rhythm was maintained throughout. And Mick - the trails and tribulations of the last few months, very difficult they must have been...you would not have known. From first to last he was in charge - he ran the show. He enquired of his audience about the upcoming football Workd Cup - and asked about a Switzerland v England final. There were few takers for that coupling in the final - albeit he - and I- would gladly welcome it. As the greatest showman who has no doubt seen it all before - it could have been his first show. His athleticism, his singing, his showmanship, his charisma, his ability to deliver to his audience and take them with him - simply brilliant. Fabulous show, fabulous band. The best.